After excessive drinking was named one of the culprits of the “decline” in the “quality” of the British people in the 19th century, alcoholism became of interest to medical doctors, scientists, criminologists, and public officials alike. During this period, language from the emerging evolutionary and embryological sciences tied moral judgements about race and class to the body, especially to the bodies of pregnant women. The problem of alcoholism amplified this biological determinism by raising questions about the relationship between disease and free will. The evolutionary sciences, alcoholism, and pregnancy, examined together, illuminate the complicated dynamics between moral intuitions and social judgements about women, scientific research, and political policies, both in the late Victorian period and now. The term “degenerate” was used to identify immoral and corrupt people, including alcoholics in the 19th century. The language of degeneration also designated a meeting point between these social judgements, imperial campaigns, and emerging biological categorization systems. According to Mariana Valverde in her book Diseases of the Will, when alcoholism became a disease, it was considered both a physical and moral affliction in need of treatment, cure, and punishment. As Valverde points out, persistent late Victorian paradigm of “bodily features [as] moralized, and moral vices [blamed] for physical degeneration” meant that consuming alcohol could be understood to be part vice, part disease. In an empire where alcoholism was widespread amongst men and women, drinking habits were identified as a potential cause of national degeneration and were reinforced by public campaigns developed by the British Journal of Inebriety. Women, the poor, and people of color were disproportionately affected by Britain’s Inebriety Acts, which began in the 1870s, and stated that habitual drunkards were to be committed to a “home for inebriates.” Over the next 30 years, the majority of those arrested were women who had previously been charged with prostitution, a profession reserved for the lower class. The poor and racialized had always been seen as a risk to the (re)production of the (ideal) British people, both in England and its colonies. The Inbriety Acts brought together legal definitions of alcoholism, cultural stigmas about women’s sexuality, and medicalized anxieties about atypical births as a result of women’s drinking in order to control the reproduction of the “inferior” British population. During the Victorian period, it was thought that the moral and social conduct of the mother could shape the child’s mind and body. The disease of alcoholism, which could have been considered to express a social or medical problem independent of individual behavior (like getting the flu), became the fault of each individual. Thus, women who drank were subject to imprisonment. Leading experts in alcoholism claimed that the consequences of drinking by “feeble-minded” women could be visually identified by women’s physical characteristics, and therefore the “Inspector of Inebriates” included photographs of “physically deteriorated” women in his reports. The Inbriety Acts brought together legal definitions of alcoholism, cultural stigmas about women’s sexuality, and medicalized anxieties about atypical births as a result of women’s drinking in order to control the reproduction of the “inferior” British population. Victorian social anxieties about morality, reproduction, and will met scientific determinism in evolutionary theory and the emergence of embryology. Towards the end of the 19th century, this new language for the body provided a framework for disease that could not only impair an individual but, more importantly, a whole population. In the Victorian period, a person’s evolutionary trajectory – their blood line – could include their moral conduct and will. Although the mechanism by which evolution by natural selection functioned remained unclear, the logic of evolution could be used to support claims about national, racial or ethnic superiority. Charles Darwin’s contemporary, Herbert Spencer, hypothesized the “survival of the fittest” which emerged from Darwin’s claim that heredity relied on survival. Moreover, evolutionary theory was used to support colonial ideology, prompting fears that the potential uptake of immoral lifestyles, as well as contact and even inter-breeding with more “primitive” people which would risk the future of the British nation. Ideas of degeneration, namely the linkage of an individual organism’s biological regression with societal deterioration, were circulated across Europe by the likes of Ray Lankaster, a 19th century British zoologist, who provided a “scientific basis” to the specter of Social Darwinism in biological terms. Lankaster argued that organisms could develop backwards in utero, and along with his friend H.G. Wells, feared the “physical, intellectual, and cultural degeneration” of Britain. Although used in differing ways in various scientific and social circles, the language of degeneration was provocative and powerful, discursively binding evolutionary theory, embryology, medicine, and criminology in the political sphere. Although used in differing ways in various scientific and social circles, the language of degeneration was provocative and powerful, discursively binding evolutionary theory, embryology, medicine, and criminology in the political sphere. The case of pregnant drinkers makes this especially clear. Scientific conceptions of degeneration emerged from a controversial account of evolutionary science that is often attributed to the German scientist Ernst Haeckel. Working at the turn of the 20th century, Haeckel’s account of evolutionary processes appeared to be all-encompassing. Most famously, Haeckel used embryos as evidence in evolutionary theory. He created image series using embryos he chose and illustrated himself to represent how the evolution (over thousands of years) of more primitive organisms into complex beings, like humans, was recapitulated in the development of a human fetus. 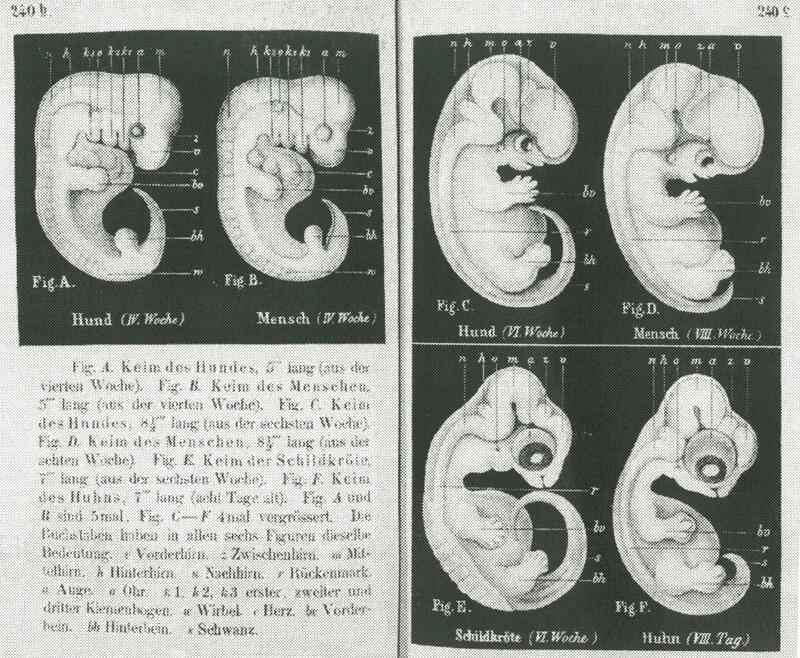 Haeckel’s embryology reinforced the public dialogue surrounding the role of the mother and her actions in the physiological shaping of a fetus. In his account of embryology, since each fetus underwent the entire development of living forms in the womb, its physical characteristics would be shaped by evolutionary forces throughout its gestation time. Degeneration theory circulated throughout Europe and provided a shared vocabulary for stigmatizing maternal drinking. By 1867, the British doctor Henry Maudsley had already popularized the notion that uncontrolled drinking was both a cause and a symptom of degeneration. In Disease of the Will, Mariana Valverde argues that degeneration theory translated “old moral judgments about the mentally handicapped, single mothers, and vice into the scientific language of evolution.” It also reinforced the common Victorian conception that women did not have as much willpower as men, so they needed to be carefully surveilled and regulated. Even though much of Haeckel’s work was eventually rejected, moral judgements about women and their conduct remained and were only strengthened by scientized language about degeneration. The resilience of these moral judgements against pregnant women who drink alcohol is evident in their persistence. That pregnant women and their alcohol consumption have been at the forefront of the “problem of alcoholism” well into the 21st century demonstrates to what extent the social and political understanding of women’s individuality, responsibility, and will bleed into questions of biological heredity and science policy. In contemporary debates surrounding epigenetics, questions of free will and determinism have re-emerged and found a home in women’s bodies and choices about their day-to-day conduct. Pregnancy remains an embodied hyper-personal experience, an institutionally-regulated bodily event, and a scientific object of study that carries with it the moral judgements of the Victorian period, as well as a variety of new-found baggage. Mariana Valverde, “‘Slavery from within’: The invention of alcoholism and the Question of Free Will,” Social History 22 (3): 1997, pp. 251-268. Emma Pask is a PhD student in the Conceptual and Historical Studies of Science at the University of Chicago. She has a background in Ecology and in the Philosophy of Biology. She studies scientists and their objects/subjects to investigate the biological, cultural, political, and social borders and boundaries of individuals, communities, and ecosystems.